This set of Electrical Machines Multiple Choice Questions & Answers (MCQs) focuses on “Action of commutator”. Explanation: Commutator is a rotating segment to which brushes are attached. 2. Commutator action is analogous to _________ in analog electronics. Explanation: Commutator converts the alternating voltage induced at the armature to the unidirectional voltage at the slip rings. Explanation: Inductive kick is the name given to the reactance voltage which occurs at the commutation taking place in the commutator.It occurs due to the high circulating current during the commutation. Explanation: Commutating poles are placed under the armature poles and it compensates only poles under these regions. Explanation: The commutating poles undergoing commutation should have zero voltage across it so that there is no reactive voltage induced. So it will not cause large circulating current in the winding. Explanation: Commmutator segment is equal to number of coil slots. Explanation: Commutator pitch for the wave connected progressive winding should be 1. Explanation: To obtain proper commutation without any sparks, the magnetic neutral axis and geometrical neutral axis should be aligned to each other,such that coils undergoing commutation experience zero emf across them. 10. The armature rotation in the dc machine and the magnetic field are independent of each other and obey laws of conservation of energy. Explanation: The armature rotation does not affect the stored magnetic energy at the steady state of operation. Explanation: Under commutation takes place when the commutation speed is slow and it takes more time than critical defined time for commutation. Because of this the trailing edge of the brush still remains under the commutation. Explanation: The over commutation, over commutation or rapid reversal of the current, any of these reasons can lead to sparking at the brushes. 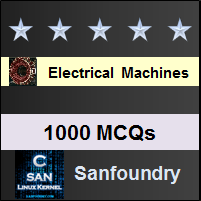 To practice all areas of Electrical Machines, here is complete set of 1000+ Multiple Choice Questions and Answers.